You have an Exchange Server 2010 organization named Contoso.com. Two Client Access Servers named CAS1.contoso.com and CAS2.contoso.com. A Client Access array named array1.contoso.com. You need to issue an X.509 certificate for Outlook Anywhere on CAS1.contoso.com. What domain name should you specify for the certificate? You purchase a wildcard certificate. You plan to use the certificate for Outlook Anywhere. You need to configure an Exchange organization to use the certificate. A. From the Exchange Management Shell, modify the properties of the WEB Outlook Provider. B. From the Exchange Management Shell, modify the properties of the EXPR Outlook Provider. Firstly we need to enable Outlook Anywhere on our Exchange Server, secondly we need to tell Exchange to use our wildcard certificate for outlook anywhere connections. We can do that with the Powershell command Set-OutlookProvider EXPR -CertPrincipalName msstd:*.contoso.com We should also set the Outlook client with the same settings, although outlook 2010 using Autodiscover should automatically set the correct settings in the user profile, the good idea is to check if everything is correct. All users on your network run Microsoft Office Outlook 2007 to access their mailboxes. Outlook 2007 is configured to connect by using RPC over HTTP and Auto discover. 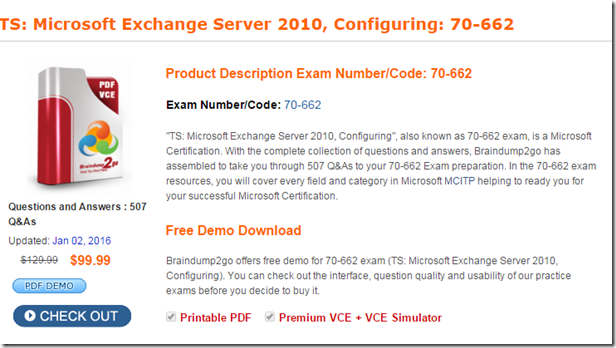 You perform a Typical installation of Exchange Server 2010 on a new server, and then move mailboxes to the new server. Users now report that they cannot access their mailboxes. You need to ensure that all users can access their mailboxes. What should you do from the new server? A. Select the Switchover Server option. B. Enable and configure Outlook Anywhere. C. Create and configure a Client Access array. D. Rename the OWA virtual directory to Exchange. All users access their mailboxes by using Microsoft Office Outlook 2007, Outlook Anywhere, and Autodiscover. You need to prevent users who have client computers that are joined to the domain from being prompted for authentication when they use Outlook Anywhere. All other users must be prompted for authentication when they use Outlook Anywhere. A. Configure Outlook Anywhere to use Basic authentication. Enable only Basic authentication on the RPC virtual directory. B. Configure Outlook Anywhere to use NTLM authentication. C. Configure Outlook Anywhere to use Basic authentication. Enable Basic authentication and NTLM authentication on the RPC virtual directory. D. Configure Outlook Anywhere to use NTLM authentication. You install a new Exchange Server 2010 organization that contains a Client Access server named CAS1. A. Reissue a self-signed certificate to CAS1. B. Configure the default Web site on CAS1 to require SSL. C. Issue a trusted certificate that contains multiple subject alternate names. D. Install Active Directory Rights Management Service (AD RMS) on a member server. You need to ensure that a user named User1 can access his mailbox by using only Outlook Web App. A. Modify the mailbox features for User1. C. Create an Outlook Web App Mailbox policy. D. Remove the Autodiscover record from the DNS zone. Users report that they can share free/busy information with users at a federated partner, but they cannot share contacts with those users. You need to ensure that your users can share contacts with users at the federated partner. The organization is authoritative for the contoso.com domain. The network contains a Windows Server 2008 R2 certification authority (CA). You have a server named Server1 that has the Client Access, Hub Transport, and Mailbox server roles installed. You plan to create a Federated Sharing relationship between your company and another company named Northwind Traders. Northwind Traders has an internal root CA. You need to install a certificate that can be used to create the federated trust. A. Generate a self-signed certificate. B. Request a Computer certificate from the contoso.com CA. C. Create a computer certificate request and submit the request to a third party trusted CA. D. Create a computer certificate request and submit the request to the Northwind Traders CA. 1- In DNS Manager, expand the DNS server you want, and then expand Forward Lookup Zones. 2- Select the forward lookup zone in which you want to create the TXT record. 3- From the menu bar, navigate to Action > Other New Records. 4- In Resource Record Type, select Text (TXT), and then click Create Record. – Record name (uses parent domain if left blank) Leave this field blank, allowing it to create a record with the same name as the domain name. – Fully qualified domain name type (FQDN) This read-only field displays the FQDN created by concatenating the record name to the domain name. – Text Type the federated domain proof string that was generated when you ran the Get- FederatedDomainProof cmdlet. 7Zyr2i/fE/M/T3AwCpitDbF30Fk/TdzXME6f7d1lDaKGthPdoS+UF94t43D2nU5hLNnIAP+5A3jJR2ik9HDPgg==, you would enter the entire string in the Text field. 6- Click OK, and then click Done to create the record. The organization is authoritative for the domain contoso.com. You need to ensure that federated partners can automatically locate the Client Access servers in the organization. What should you create from an external DNS server? As mentioned in another question, this should actually be a CNAME record, according to Technet, but I left this in here as an A record for contoso.com would need creating before the CNAME for autodiscover.contoso.com. The exam will only mention CNAME records though.